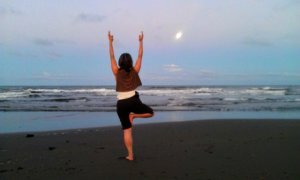 My beginners yoga information in this article is a perfect place for you to start ff you are new to meditative movement and feel drawn to yoga! I cover yoga basics that everyone should know, whether a beginner or not. 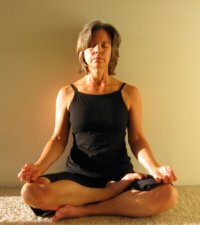 This article is a great refresher for those who do not need beginners yoga, but need to be reminded of best practice. As I write this, all of my yoga tips are fresh in my mind, from my yoga teacher training that I attended. Most of the yoga tips that I will give you are great advice tips for ALL forms of body movements. If all of us approached our physical movements in a mindful way, there would be so much less muscular tension, illness and injuries. This is what I refer to as intuitive movement throughout my website. This article will focus on yoga tips that are more spiritual and conceptual in nature. Yoga is more a lifestyle than just the yoga poses, or asanas. However, I will use the word "yoga" as we in the West commonly refer to the physical asanas. 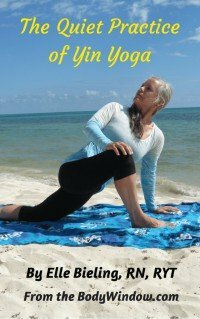 There are many physical yoga tips that I cover in More Yoga Tips for Beginners and Everyone! These yoga basics in this article have more to do with grounding and alignment in the physical asanas. Some of these yoga tips I offer were never, ever taught to me, despite years of yoga practice. If you follow these guidelines, that I learned at my yoga teacher training, you will be so much farther ahead than most! Obtain clearance from your Primary Healthcare Provider. This is especially true if you are over the age of 40, pregnant, postpartum or if you have a chronic illness like asthma, arthritis, diabetes and so forth. Credible yoga teachers will require that you fill out health information that will alert them to any condition that may affect your ability to practice yoga. It is up to your teacher’s discretion whether or not you present him or her with your PCP’s written clearance. For beginners yoga, if you are new to the asanas, it is very important that you evaluate your physical capabilities. Be present to your body. Your personal yoga practice is about listening to your body. It is your personal challenge to meet your body on your mat and be open to its resistances. Relaxation is your natural state. Muscle tension is not. Yoga’s goal is to attempt to return you to your natural state. Your yoga work then is to find your resistances in your body that are a metaphor for the resistances in your life. Keep this in mind when you do your beginner yoga poses. Practice compassion towards yourself and your body. Don’t think negatively or talk to yourself negatively about your body, regarding what it can and cannot perform. When practicing beginners yoga, it is all too easy to beat yourself up for what your body is unable to do. Release all judgment about this. Resist the urge to think negatively about yourself. The practice of yoga is about learning who you are and where you are in each present moment. Accept who you are in the moment. With each passing day that you practice, your mind and body will respond. You will quickly see improvements, if you come to the mat with an open and accepting heart. Practice compassion towards others and other's bodies. There will be those in your yoga class that look better than you and those who look worse. Send blessings and positive thoughts to them all. You don’t want anyone else judging your performance ~ do not judge others performance. Check your ego at the door. Resist the urge to make comparisons with yourself and others. It is in our nature to do this, so when you feel the urge to compare, instead think of a complement to give the object of your attention. Set your intent for your practice. Prior to each beginners yoga class, set your intention in your heart for what you wish to accomplish. Say positive affirmations, that can be very simple, like, "I honor my body in this moment," "I release myself from stress" (or fear, or worry, or pain, etc), "I am grateful for all that I am and all that I have," and "I am full of joy on this sunny day!" Forever remove the concept of "no pain, no gain." Contrary to popular fitness belief, P90X is NOT yoga. Pushing to the extreme of your ability to achieve a nebulous physical goal is not practicing yoga. Pushing and pulling to the level of pain is not yoga. (By the way, if weight loss is your yoga goal, remember that yogis are skinny! They get there by controlling the mind, NOT by forcing the body. Yoga will help you control your mind to bring peace and calm, and in this regard, to control your weight.) Beginners yoga will leave your muscles feeling sore at first. This should only be mild! If your new yoga practice leaves you hobbling around, back off a bit and go slower the next time. Expend the least amount of energy possible to hold the pose. The achievement of great things in yoga requires the utmost calm. Using force to push yourself into a yoga pose will only make you weaker in that pose. Worse yet, if you force a pose you have the great potential to injure yourself. As you learn to connect the breath within the form, ease in the pose heightens. The action is within the relaxation. This is the great paradoxical truth about yoga. Strive for it at all costs. Do not rush yoga. You must hold a pose to fully experience the pose. Ancient yogis say that in order to really know a pose you must hold it for a minimum of 30 minutes!!! Where does this leave Power Yoga?? The slower you move from yoga pose to yoga pose, the harder it is! Controlling your muscles through your mind and your breath by going slowly takes great strength and mental focus. This is what you should strive to achieve. I know that many yoga flows out there are fast and aerobic. If you are drawn to that type of beginners yoga, hit the back button and look elsewhere. Let your breath be your guide. If there were only ONE rule of yoga that you would follow, this would be the one! Go into a yoga pose only so far as you can comfortably breathe. As you hold a yoga pose and breathe into the pose, you will notice that you can often go just a little deeper with each exhale. 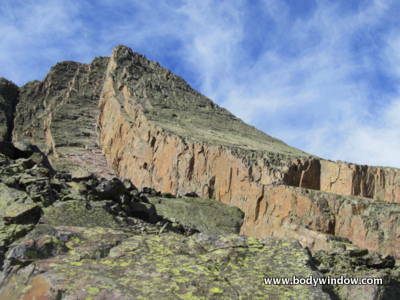 The inhalation will fill you with oxygen and energy, while relieving your body of tension. As the tension is released, your body will respond and go deeper. For beginners yoga, this is of extreme importance. A relaxed body will do so much more than one that is over-striving and tense! Warm up first. Start with gentle movements that warm up your spine. All movements in yoga originate in the spine, so it is very important to warm up your spine first, especially before doing twisting movements. I personally like to warm up with a few gentle sun salutations, or Qi Gong movements. The ancient yogis recommend taking a warm bath before your yoga practice to limber up the body. This is certainly the best way to warm up! If you don’t have time for a warm bath, go slow with your warm up exercises before you try the more difficult yoga poses. Practice on an empty stomach. Do not attempt a yoga practice on a full stomach. Wait at least two hours after a meal to do yoga for beginners. My yoga teacher training intensive started at 6:00 a.m. and we had no food prior to 8:00 am. It can be done. If you must have something, drink a glass of the type of milk of your choice, or some juice or a piece of fruit. Only have something very light and easily digested. Empty your bladder and bowels if possible before your practice. Most of us can’t evacuate our bowels on cue, but we can certainly empty our bladders. If you take hot coffee or tea, indulge in a cup with some milk prior to your yoga practice. This often triggers a bowel movement especially if you practice first thing in the morning. Hydrate before and after your yoga practice. The practice of yoga massages your organs and your tissues allowing for the release of metabolic wastes. Staying hydrated will aid you in this process. You will feel cleansed by drinking a cup of hot tea after your beginners yoga! Chose your best time of day for your beginners yoga when you will be able to commit daily and when/where you will not be disturbed. If you go to a yoga studio, it will be easy to be uninterrupted. If you practice at home make sure you have a place set aside for privacy, and that your friends/family understand that you are not to be disturbed. Develop your own private, personal practice. Even if you are practicing beginners yoga in a studio, take the time to practice yoga at home, taking from what you learned in your classes. This time is important for reflection and assimilation of what you learned. I find that my yoga practice is way more beneficial when I can move into where I want to go, and I can reflect on my own resistances, in the quiet stillness of the morning when I am alone. As you do more yoga you will learn to develop your own body awareness and learn how to honor your own body’s needs. I hope that you will be rewarded by your new beginners yoga practice! I hope that these yoga tips that I have given you will aid you in your journey for self-discovery. Yoga is a marvelous way for you to learn about yourself and where your tensions and resistances are. Nothing is more important in beginners yoga than these yoga basics. May you journey forward on your path to wholeness and health of your body-mind-soul, through learning beginner's yoga, best practices!